On January 31, Ryan Reynolds (Deadpool, Deadpool 2) announced to the world that he and his perennial punching bag Hugh Jackman (The Wolverine, Logan) had called a truce to their antagonistic relationship. 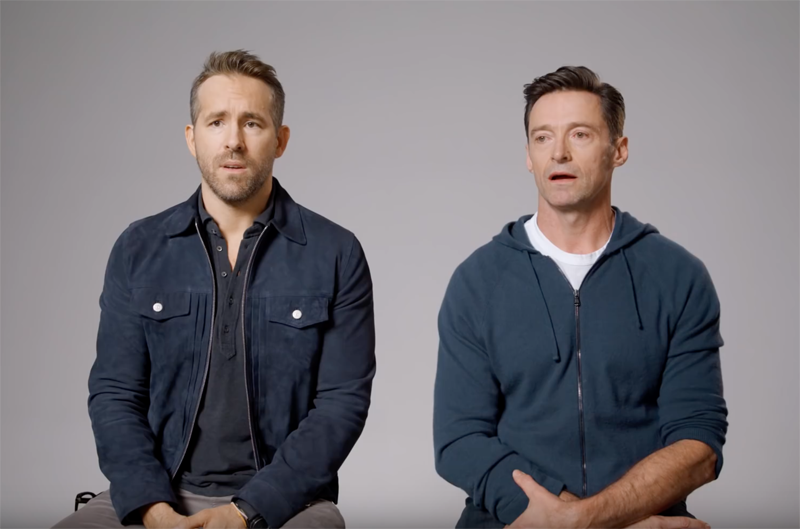 Now they’ve managed to settle their differences by making commercials for each other’s branded beverage companies, and you can check out the results in the hilarious video with Ryan Reynolds and Hugh Jackman below! In 2009, Hugh Jackman traveled to Ethiopia to visit a community development project and met a young coffee farmer named Dukale, working to lift his family out of poverty. Inspired by Dukale’s story, Jackman launched Laughing Man Coffee in 2011 to provide a marketplace for farmers in developing countries to sell their goods to consumers in the U.S. As part of his ongoing commitment, Hugh contributes 100% of his profits to the Laughing Man Foundation, which he created to support educational programs, community development and social entrepreneurs around the world. Founded by bartender Ryan Magarian and distillery owner Christian Krogstad in Portland, Oregon in 2006, Aviation Gin was then purchased by Davos Brands in 2016. The company was launched to the next level when Ryan Reynolds took an interest in the company, acquiring a stake in the brand from Davos in February 2018 and becoming its public spokesperson. The post Ryan Reynolds and Hugh Jackman Call a Truce in New Ad appeared first on ComingSoon.net.